This clock doesn’t have hands or numbers, but is illuminated to indicate the exact time…but only every five minutes! It is plated in gold and moves on a giant grasshopper, known as “cronófago” or “devouring time,” with each step marking a second. The movements generate flashes of blue light to mark time. Value? $1.8 million dollars. Its creator? John Taylor, who with 72 years specializing in the measurement of time has the intention to stimulate interest in this field of science. Wow! One liter of water can move the car for about 60 minutes at an approximate speed of 80 kilometers per hour. Not even need to be distilled water or even work with seawater. The design is primitive and the company are planning to separate hydrogen from water and convert it into fuel for an electric battery. The company has not revealed as to have the car to move only with water but if that claim is based on existing technologies, but they are capable of producing hydrogen from water for a longer time than any method available at this time. Stop-Motion is an animation technique that involves photographing miniature objects or characters a frame at a time, changing the pose or position of the object between each frame. The result, when played back at normal speed, is of a continuously animating object. I really like this technique. The result are visually incredible. Stop motion is usually used in animation films. One of the most incredible films that used this technique was The Nightmare Before Christmas. Special effects are divided into the categories of optical effects and mechanical effects. 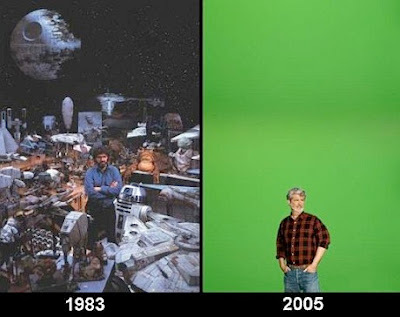 Years ago, people were really impressive for the special effects in some films because the cinematographs used to use mechanical effects. Now, there are many films (usually blockbusters, films with a very big production budget) that use the special effects because are more comfortable. But there is the problem, optical effects are very expensive. What do you think that is more suitable? Optical effects or mechanical effects? I think that the best is use a mixture of optical and mechanical effects. The results are more realistic. I have just seen “Hellboy” and I like the use of this mixture, is really awesome.